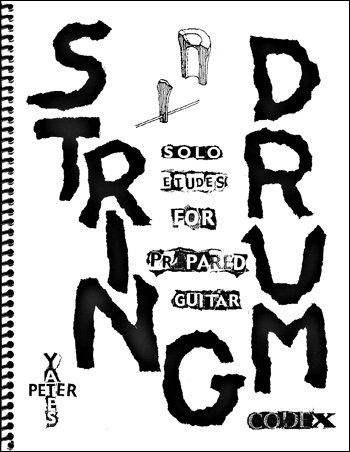 String Drum Codex is a collection of eight solo guitar pieces, all of which require the instrument to be prepared with the same eight objects. This allows them to be performed individually or as a suite lasting about eleven minutes. The works range from atmospheric soundscapes to rhythmical grooves, and include occasional opportunities to improvise. The book itself is a work of unusual calligraphic art in which musical elements, such as note-heads, accidentals, fingerings, and ornaments are hand printed using hand-carved stamps. This, along with the arcane treasure hunt aspect of obtaining objects and preparing the guitar, give the product a neo-medieval look and flavor, hence the use of the term "Codex" in the title. These pieces of prepared guitar music are recorded on the Ultimate Gazebo CD.